Home / Uncategorized / Fantasy NASCAR fan makes history- takes home trophy. 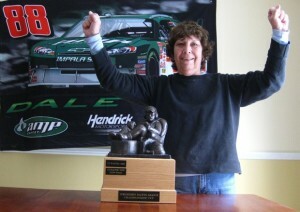 Fantasy NASCAR fan makes history- takes home trophy. I think if she keeps winning the title and taking home the Armchair Crew Chief it may be hard to persuade others to join. Thanks for the photo Carol and for making history.